Uncommon fun at MOFGA’s Common Ground Country Fair! 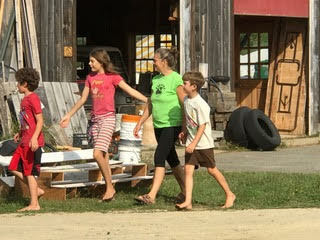 One of our families favorite activities at School Around Us is volunteering as a whole school at the Common Ground Country Fair in Unity Maine! Our family looks forward to not only attending the fair, but we really have a blast volunteering the day before the fair opens helping with set up preparations for the thousands of folks to who attend the fair. For more than 20 years School Around Us has been volunteering at the Common Ground Fair. This year was no exception, students K-8, parents, and teachers took part volunteering all over the fair grounds. Wearing our greenSAU t-shirts we could be found Raking the Berm ( a.k.a. 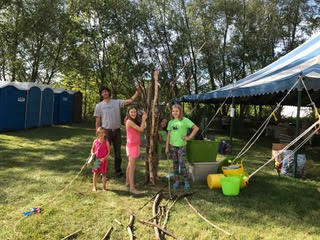 the sliding hill ), helping set up the children’s area, working with recycling and composting setting up receptacles and signs, weeding, painting and flagging tent poles, and folding t-shirts for distribution to vendors and more! After we finish working hard all afternoon we all gather to in the Common Kitchen to share a mealof uncommon goodness! The food is donated by Maine farms and families all over the state and provides fresh local meal to fair volunteers. 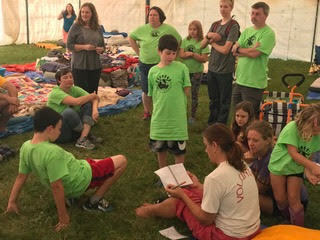 We settle down for the night in the volunteer tent, although some prefer to set up a tent in the volunteer camping woods. We talk and laugh while the kids play togethersliding on the berm or roaming around the grounds getting first look at what to expect when the fair actually opens. We wake up Friday morning full of anticipation of what fun the day will bring at the fair! Good food, some great classes and educational offerings, farm animals and demonstrations. My daughter, Gina and her friends say one of their favorite things to do is checking out all the samples provided by vendors throughout the fair. Other favorite activities include, attending the border collie demonstration or spending time in the children’s area doing arts and crafts, face painting and more. The day wouldn’t be complete with out our last gathering together as a community at the sun dial at noon in the heart of the fair grounds. We eat, laugh, and talk about all the fun things we have been up to that morning and separate for the day. This year however we had a special gathering on the berm to watch Josie’s dad, Josh play with his band( El Grande ) on the big stage.